The Synagogue is to be a building of learning. It has been sited and designed to be the building of central focus of the campus. The Synagogue is prominently situated near the lead end of the academic campus axisthe “main entrance” to the campus complex and conveniently located for all. The Synagogue is near the geometric center of the campus, presenting itself as a symbolic pillar or foundation for campus unity. Its exterior wall surface will be clad entirely of Jerusalem stone. The Synagogue serves a dual function, for both learning and prayer. Its sanctuary is designed for both teaching with tables and chairs, as well as for prayer in a formal or informal configuration. The 15,700 sqft. 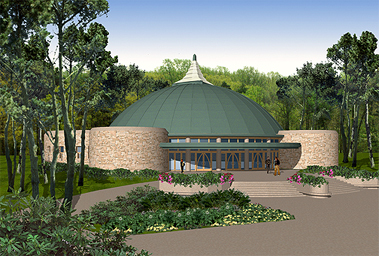 building is a single-story articulated circular form with a high-domed roof clad in the glazed tile common to all campus buildings. Seating capacity is normal fixed seating for 800, expandable to 1,000. In addition, the building will have four classrooms for Religious Education, a Library, Conference Room, and storage space for moveable chairs and tables. A central, flat floor area will be used at times for other than religious activities, therefore the Bima is mobile and can be stored. Classrooms are convertible to seat moveable chairs for adjunct seating space to the sanctuary for larger religious services.